THE FLOWERING PLANTS. Angiosperms made their first appearance 125 million years ago and, 25 million years later, thanks to climatic changes, rapidly diversified and have since been the most dominant and familiar spermatophytes—the seed plants. Evidence suggests that angiosperms did not evolve from the more primitive gymnosperms (which include conifer evergreens) but developed separately. Angiosperms are more adaptable than gymnosperms and can grow in different soils and under disparate climatic conditions. When compared with gymnosperms, the angiosperms have a more efficient reproductive apparatus. Their seeds are protected inside fruits and are pollinated by insects and other animals, and so the seeds are more efficiently carried than just by wind currents. Some three-quarters of all angiosperms are eudicots (formerly called dicots), which include such diverse flowering plants as carnations, roses, tobacco, legumes, potatoes, grains, maples, and sycamores. Representing 90 percent of all plants, with 250,000 species, angiosperms are second only to insects in number. They exhibit a wide variety of sizes, shapes, colors, smells, and arrangements, features which account for their highly specialized partnerships with mutualistic pollinators, a classic case of co-evolution of two distinctive organisms; wind-pollinated flowers lack colorful parts. The flowers of angiosperms are often not only beautiful but also serve as highly efficient and distinctive reproductive systems that contain male or female reproductive structures, or both, within the same flower. Gametes are produced in separate organs within the flower, and fertilization and development of the embryo occur internally, thus providing protection against vagaries of the weather. Pollen, which contains sperm, is formed by stamen, while the ovule is produced by the pistil. Pollen is transferred to a receptive surface on the pistil where it germinates. The sperm is then transported to the ovule, through the pollen tube, and fertilizes the ovule in the pistil. Tissues grow around the embryo, which thickens, and the seeds develop into fruit. Like pollen and seeds, fruits are not only dispersed by winds but also by animals that eat the fruit; the seeds pass through the digestive tract undigested and are deposited in the feces at another location. SEE ALSO: Land Plants (c. 450 Million BCE), Insects (c. 400 Million BCE), Seeds of Success (c. 350 Million BCE), Gymnosperms (c. 300 Million BCE), Ecological Interactions (1859). 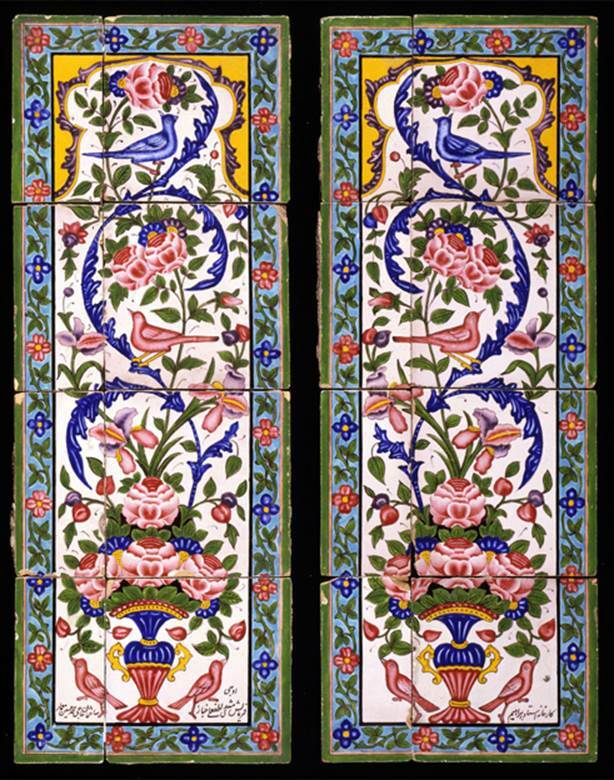 There are over 250,000 species of angiosperms, the flowering plants, likenesses of which appear on these two Iranian panels of earthenware tiles dating from the first half of nineteenth century.